The gleam of the America's Cup lit up the stage at the 2014 BBB Hawaii Torch Awards in Honolulu last week. On hand to describe the heart-stopping moments, the ambitions and the anxieties on the journey to winning the America's Cup was Norbert Bajurin, Commodore of San Francisco's Golden Gate Yacht Club, the current holder of the oldest international sporting trophy. 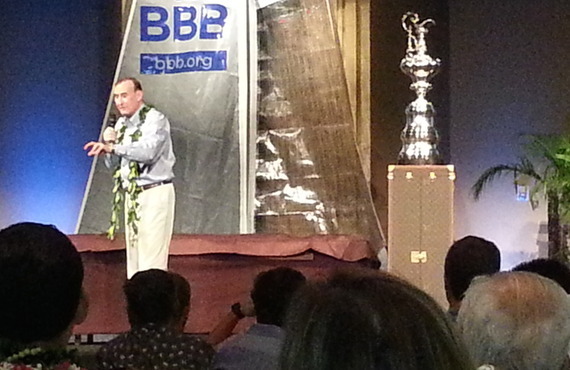 The story of how a debt-laden yacht club approached Oracle's Larry Ellison, one of the richest men in the world, to collaborate on bringing the America's Cup back to the United States was a story studded with many heart-stopping moments. It captured the adrenalin that so many entrepreneurs experience as they stretch themselves and their resources to realize their dreams of building something worthwhile. Equally important it captured the importance of trust and teamwork in building success. 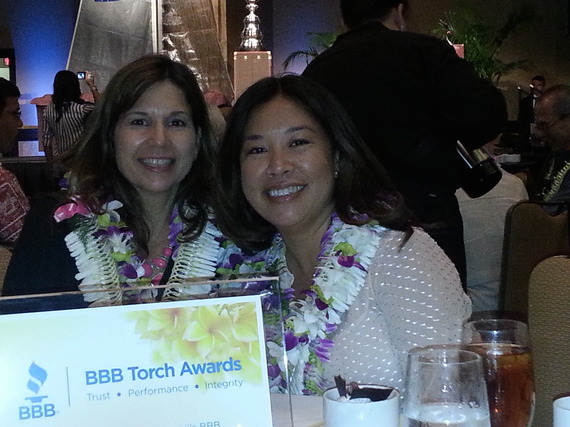 Winners in the Small Business category, Sarah Kalicki Nakamura(left) and Cindy Sakai identified with the importance of building trust with island companies who use their company Think,LLC to transform workplaces and develop solutions that help employees optimize their performance. The heads of Aloha Data Services, founded in 2003 and Staffing Solutions of Hawaii which started operations in 1991, are good friends who were thrilled to both get the award for medium size businesses. 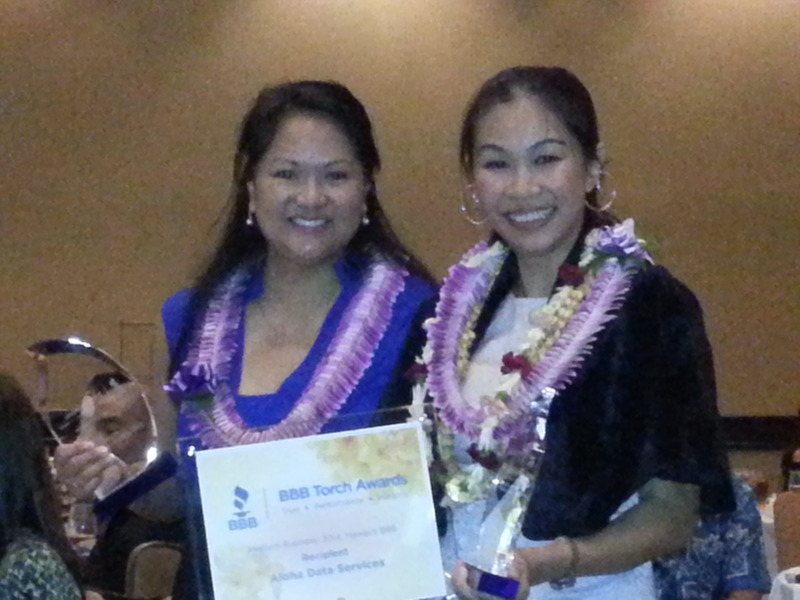 Ina Chang(right), who heads Aloha Data, understands the critical importance of trust, given that her company handles the analysis, transcription, translation and ediscovery of often sensitive documents for a diverse group of big and small clients. Lisa Truong Kracher's company matches qualified candidates at all levels to organizations seeking to fill both temporary and permanent positions. 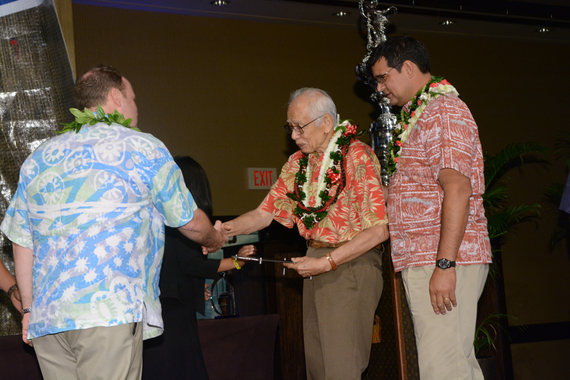 BBB Hawaii's Public Charity award went to Lemonade Alley c/o BizGym Foundation, represented by founder, Steve Sue and the Keauhou Award was given to John Dean, President and CEO of Central Pacific Bank.